Fruit preserves are preparations of fruits, vegetables and sugar, often stored in glass jam jars. Many varieties of fruit preserves are made globally, including sweet fruit preserves, such as those made from strawberry or apricot, and savory preserves, such as those made from tomatoes or squash. The ingredients used and how they are prepared determine the type of preserves; jams, jellies, and marmalades are all examples of different styles of fruit preserves that vary based upon the fruit used. In English, the word, in plural form, "preserves" is used to describe all types of jams and jellies. The term preserves is usually interchangeable with jams. Other names include: chutney, confit, conserve, fruit butter, fruit curd, fruit spread, jelly, and marmalade. Some cookbooks define preserves as cooked and gelled whole fruit (or vegetable), which includes a significant portion of the fruit. In the English speaking world, the two terms are more strictly differentiated and, when this is not the case, the more usual generic term is 'jam'. The singular preserve or conserve is used as a collective noun for high fruit content jam, often for marketing purposes. Additionally, the name of the type of fruit preserves will also vary depending on the regional variant of English being used. A chutney is a relish of Indian origin made of fruit, spices and herbs. Although originally intended to be eaten soon after production, modern chutneys are often made to be sold, so require preservatives – often sugar and vinegar – to ensure they have a suitable shelf life. Mango chutney, for example, is mangoes reduced with sugar. While confit, the past participle of the French verb confire, "to preserve", is most often applied to preservation of meats, it is also used for fruits or vegetables seasoned and cooked with honey or sugar till jam-like. Savory confits, such as ones made with garlic or fennel, may call for a savory oil, such as virgin olive oil, as the preserving agent. Konfyt (Afrikaans: "jam" or "fruit preserve") is a type of jam eaten in Southern Africa. [clarification needed] It is made by boiling selected fruit or fruits (such as strawberries, apricots, oranges, lemons, water melons, berries, peaches, prickly pears or others) and sugar, and optionally adding a small quantity of ginger to enhance the flavour. The origins of the jam is obscure but it is theorized that it came from the French. The word is also based on the French term confiture via the Dutch confijt (meaning candied fruit). A conserve, or whole fruit jam, is a preserve made of fruit stewed in sugar. Traditional whole fruit preserves are particularly popular in Eastern Europe (Russia, Ukraine, Belarus) where they are called varenye, the Baltic region where they're known by a native name in each of the countries (Lithuanian: uogienė, Latvian: ievārījums, Estonian: moos, Romanian: dulceață), as well as in many regions of Western, Central and Southern Asia, where they are referred to as murabba. Often the making of conserves can be trickier than making a standard jam; it requires cooking or sometimes steeping in the hot sugar mixture for just enough time to allow the flavour to be extracted from the fruit, and sugar to penetrate the fruit; and not cooking too long such that the fruit will break down and liquify. This process can also be achieved by spreading the dry sugar over raw fruit in layers, and leaving for several hours to steep into the fruit, then just heating the resulting mixture only to bring to the setting point. As a result of this minimal cooking, some fruits are not particularly suitable for making into conserves, because they require cooking for longer periods to avoid issues such as tough skins. Currants and gooseberries, and a number of plums are among these fruits. Because of this shorter cooking period, not as much pectin will be released from the fruit, and as such, conserves (particularly home-made conserves) will sometimes be slightly softer set than some jams. An alternative definition holds that conserves are preserves made from a mixture of fruits or vegetables. Conserves may also include dried fruit or nuts. Fruit butter, in this context, refers to a process where the whole fruit is forced through a sieve or blended after the heating process. Fruit curd is a dessert topping and spread usually made with lemon, lime, orange, or raspberry. The basic ingredients are beaten egg yolks, sugar, fruit juice and zest which are gently cooked together until thick and then allowed to cool, forming a soft, smooth, intensely flavored spread. Some recipes also include egg whites or butter. Although the FDA has Requirements for Specific Standardized Fruit Butters, Jellies, Preserves, and Related Products, there is no specification of the meaning of the term Fruit spread. Although some assert it refers to a jam or preserve with no added sugar, there are many fruit spreads by leading manufacturers that do contain added sugar. This can be easily verified by searching the listings under fruit spread on common web sites, such as those of Amazon or Walmart, or to look at the ingredient list and nutritional information on specific fruit spread products. "Jam" redirects here. For other uses, see Jam (disambiguation). "Strawberry jam" redirects here. For the album, see Strawberry Jam. Pectin is mainly D-galacturonic acid connected by α (1–4) glycosidic linkages. The side chains of pectin may contain small amounts of other sugars such as L-fructose, D-glucose, D-mannose, and D-xylose. In jams, pectin is what thickens the final product via cross-linking of the large polymer chains. Freezer jam is uncooked (or cooked less than 5 minutes), then stored frozen. It is popular in parts of North America for its very fresh taste. Recipes without added pectin use the natural pectin in the fruit to set. Tart apples, sour blackberries, cranberries, currants, gooseberries, Concord grapes, soft plums, and quinces work well in recipes without added pectin. Other fruits, such as apricots, blueberries, cherries, peaches, pineapple, raspberries, rhubarb, and strawberries are low in pectin. In order to set, or gel, they must be combined with one of the higher pectin fruits or used with commercially produced or homemade pectin. Use of added pectin decreases cooking time. In Canada, fruit jam is categorized into two types: fruit jam and fruit jam with pectin. Both types contain fruit, fruit pulp or canned fruit and are boiled with water and a sweetening ingredient. Both must have 66% water-soluble solids. Fruit jam and fruit jam with pectin may contain a class II preservative, a pH adjusting agent or an antifoaming agent. Both types cannot contain apple or rhubarb fruit. Though both types of jam are very similar, there are some differences in fruit percent, added pectin and added acidity. Fruit jam must have at least 45% fruit and may contain added pectin to compensate for the natural pectin level found in the fruit. Fruit jam with pectin need only contain 27% fruit and is allowed to contain added acidity to compensate for the natural acidity of the fruit. This drawing depicts a pectin molecule. These molecules combine to form the network responsible for making jelly. In North America, jelly (from the French gelée) refers exclusively to a clear or translucent fruit spread made from sweetened fruit (or vegetable) juice—thus differing from jam by excluding the fruit's flesh—and is set by using its naturally occurring pectin, whereas outside North America jelly more often refers to a gelatin-based dessert, though the term is also used to refer to clear jams such as blackcurrant and apple. In the United Kingdom, redcurrant jelly is a condiment often served with lamb, game meat including venison, turkey and goose in a festive or Sunday roast. It is a clear jam, set with pectin from the fruit, and is made in the same way, by adding the redcurrants to sugar, boiling, and straining. Pectin is essential to the formation of jelly because it acts as a gelling agent, meaning when the pectin chains combine, they create a network that results in a gel. The strength and effectiveness of the side chains and the bonds they form depend on the pH of the pectin, the optimal pH is between 2.8–3.2. Additional pectin may be added where the original fruit does not supply enough, for example with grapes. 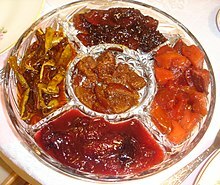 Jelly can be made from sweet, savory or hot ingredients. It is made by a process similar to that used for making jam, with the additional step of filtering out the fruit pulp after the initial heating. A muslin or stockinette "jelly bag" is traditionally used as a filter, suspended by string over a bowl to allow the straining to occur gently under gravity. It is important not to attempt to force the straining process, for example by squeezing the mass of fruit in the muslin, or the clarity of the resulting jelly will be compromised. Jelly can come in a variety of flavors such as grape jelly, strawberry jelly, hot chile pepper, and others. It is typically eaten with a variety of foods. This includes jelly with toast, or a peanut butter and jelly sandwich. Marmalade is a fruit preserve made from the juice and peel of citrus fruits boiled with sugar and water. It can be produced from lemons, limes, grapefruits, mandarins, sweet oranges, bergamots and other citrus fruits, or any combination thereof. Marmalade is generally distinguished from jam by its fruit peel. The benchmark citrus fruit for marmalade production in Britain is the Spanish Seville orange, Citrus aurantium var. aurantium, prized for its high pectin content, which gives a good set. The peel has a distinctive bitter taste which it imparts to the preserve. In America, marmalade is sweet. In general, jam is produced by taking mashed or chopped fruit or vegetable pulp and boiling it with sugar and water. The proportion of sugar and fruit varies according to the type of fruit and its ripeness, but a rough starting point is equal weights of each. When the mixture reaches a temperature of 104 °C (219 °F), the acid and the pectin in the fruit react with the sugar, and the jam will set on cooling. However, most cooks work by trial and error, bringing the mixture to a "fast rolling boil", watching to see if the seething mass changes texture, and dropping small samples on a plate to see if they run or set. Commercially produced jams are usually produced using one of two methods. The first is the open pan method, which is essentially a larger scale version of the method a home jam maker would use. This gives a traditional flavor, with some caramelization of the sugars. The second commercial process involves the use of a vacuum vessel, where the jam is placed under a vacuum, which has the effect of reducing its boiling temperature to anywhere between 65 and 80 °C depending on the recipe and the end result desired. The lower boiling temperature enables the water to be driven off as it would be when using the traditional open pan method, but with the added benefit of retaining more of the volatile flavor compounds from the fruit, preventing caramelization of the sugars, and of course reducing the overall energy required to make the product. However, once the desired amount of water has been driven off, the jam still needs to be heated briefly to 95 to 100 °C (203 to 212 °F) to kill off any micro-organisms that may be present; the vacuum pan method does not kill them all. During commercial filling it is common to use a flame to sterilize the rim and lid of jars to destroy any yeasts and molds which may cause spoilage during storage. Steam is commonly injected immediately prior to lidding to create a vacuum, which both helps prevent spoilage and pulls down tamper-evident safety button when used. Glass or plastic jars are an efficient method of storing and preserving jam. Though sugar can keep for exceedingly long times, containing it in a jar is far more useful than older methods. Other methods of packaging jam, especially for industrially produced products, include cans and plastic packets, especially used in the food service industry for individual servings. Fruit preserves typically are of low water activity and can be stored at room temperature after opening, if used within a short period of time. The U.S. Food and Drug Administration (FDA) published standards of identity in 21 CFR 150, and treats jam and preserves as synonymous, but distinguishes jelly from jams and preserves. All of these are cooked and pectin-gelled fruit products, but jellies are based entirely on fruit juice or other liquids, while jams and preserves are gelled fruit that may include the seeds and pulp. The United States Department of Agriculture offers grading service based on these standards. Under the Processed Products Regulations (C.R.C., c. 291), jams, jellies, citrus marmalade and preserves are defined. Each must contain a minimum percentage of the named fruit and a minimum percentage of water-soluble solids. Jams "shall be the product made by boiling fruit, fruit pulp or canned fruit to a suitable consistency with water and a sweetening ingredient", jellies "shall be the product made by boiling fruit juice or concentrated fruit juice that is free from seeds and pulp with water and a sweetening ingredient until it acquires a gelatinous consistency." In the European Union, the jam directive (Council Directive 79/693/EEC, 24 July 1979) set minimum standards for the amount of "fruit" in jam, but the definition of fruit was expanded to take account of several unusual kinds of jam made in the EU. For this purpose, "fruit" is considered to include fruits that are not usually treated in a culinary sense as fruits, such as tomatoes, cucumbers, and pumpkins; fruits that are not normally made into jams; and vegetables that are sometimes made into jams, such as rhubarb (the edible part of the stalks), carrots, and sweet potatoes. This definition continues to apply in the new directive, Council Directive 2001/113/EC of 20 December 2001 relating to fruit jams, jellies and marmalades and sweetened chestnut purée intended for human consumption. Extra jam is subject to somewhat stricter rules that set higher standards for the minimum fruit content (45% instead of 35% as a general rule, but lower for some fruits such as redcurrants and blackcurrants), as well specifying as the use of unconcentrated fruit pulp, and forbidding the mixture of certain fruits and vegetables with others. Extra jelly similarly specifies that the quantity of fruit juice or aqueous extracts used to make 1,000 grams of finished product must not be less than that laid down for the manufacture of extra jam. Jellied cranberry sauce is primarily a holiday treat in the U.S. and the UK. Mayhaw jelly is a delicacy in parts of the American South. ^ a b The Joy of Cooking. 1975. ^ "On the menu: confit". The Guardian. UK. 29 September 2008. Archived from the original on 9 May 2014. Retrieved 20 September 2008. Usually duck, pork or goose, although you can use other meats. ^ "Tomato Confit recipe". Bon Appétit. Epicurious. September 2003. Archived from the original on 3 October 2008. Retrieved 20 September 2008. ^ "Garlic Confit recipe". Bon Appétit. Epicurious. January 2008. Archived from the original on 6 September 2008. Retrieved 20 September 2008. ^ Osseo-Asare, Fran (2005). Food Culture in Sub-Saharan Africa. Greenwood Publishing Group. ISBN 9780313324888. Retrieved 19 August 2015. ^ a b Grange, Cyril (1992). The Right Way To Make Jams (2nd ed.). Right Way Books. ISBN 0-7160-2126-9. ^ a b Patten, Marguerite (February 2001). Basic Basics: Jams, Preserves and Chutneys Handbook (2004 reprint ed.). Grub Street Books. ISBN 1-902304-72-1. ^ a b Thomas, Midge (2 September 2002). Best kept secrets of the Women's Institute: Jams, pickles & chutneys (1st ed.). Simon & Schuster. ISBN 0-7432-2113-3. ^ Isabel D. Wolf; William Schafer (1990). "Making Jams, Marmalades, Preserves, and Conserves". University of Minnesota extension school. Archived from the original on 13 September 2008. Retrieved 20 September 2008. ^ "Cake Talk: What the terms mean". The Joy of Cooking. The Seattle Times. 29 June 2005. Archived from the original on 3 June 2008. Retrieved 2 September 2008. ^ Gordon Ramsay (20 June 2007). "Lemon and Poppy Seed Scones with Homemade Lemon Curd". The Times. UK. ^ "Title 21, Chapter I, Subchapter B, Part 150". Electronic Code of Federal Regulations. Government Publishing Office. Retrieved 9 April 2018. ^ Rolek, Barbara. "What is fruit butter? Marmalade? Jam?". the spruce. (Updated 03/20/17). Retrieved 9 April 2018. ^ Wilson, Dédé. "Fruit Spreads". Bakepedia, The Baker’s Resource. Bakepedia LLC. Retrieved 9 April 2018. ^ "Ingredient List". FDA Access Data. FDA. Retrieved 9 April 2018. ^ "How to Understand and Use the Nutrition Facts Label". Labeling & Nutrition. FDA. Retrieved 9 April 2018. ^ "Calories in Fruit Spread". SPARKPEOPLE. SparkPeople, Inc. Retrieved 9 April 2018. ^ a b c "Grading Manual for Fruit Jelly Fruit Preserves" (PDF). Archived (PDF) from the original on 9 July 2007. ^ Walter, Reginald (1991). The Chemistry and Technology of Pectin. Academic Press Inc. ISBN 9780127338705. ^ "The Science of Jam and Jelly Making UK Cooperative Extension Service (University of Kentucky College of Agriculture)" (PDF). Archived (PDF) from the original on 6 September 2015. ^ "How to Make Your Own Natural Pectin for Use in Making Homemade Jam and Jelly". pickyourown.org. Archived from the original on 31 August 2015. ^ a b Branch, Legislative Services. "Consolidated federal laws of canada, Food and Drug Regulations". laws.justice.gc.ca. Archived from the original on 13 July 2017. Retrieved 18 July 2017. ^ Wedgwood, Hensleigh (1855). "On False Etymologies". Transactions of the Philological Society (6): 66. ^ Charles Sinclair (2009). Dictionary of Food: International Food and Cooking Terms from A to Z. Bloomsbury Publishing. pp. 534–. ISBN 978-1-4081-0218-3. Archived from the original on 3 December 2017. ^ "Quince Jelly". bbcgoodfood.com. Archived from the original on 23 September 2015. ^ "Redcurrant and mint jelly". bbc.co.uk. Archived from the original on 14 September 2015. ^ Jams, Jellies and Marmalades (PDF). Neuenbürg/Württ: Herbstreith & Fox. pp. 7, 11–13. Archived (PDF) from the original on 24 September 2016 – via PDF. ^ MookyChick Central. (3 September 2014). "How To Make Jam" Archived 12 June 2015 at the Wayback Machine. MookyChick. Retrieved 11 June 2015. ^ "Processed Products Regulations". Laws-lois.justice.gc.ca. Archived from the original on 14 April 2015. Retrieved 9 August 2014. ^ Council Directive 79/693/EEC of 24 July 1979 on the approximation of the laws of the Member States relating to fruit jams, jellies and marmalades and chestnut purée. Not in force, replaced by Directive 2001/113/EC. ^ a b "Council Directive 2001/113/EC of 20 December 2001 relating to fruit jams, jellies and marmalades and sweetened chestnut purée intended for human consumption". ^ "Labelling of Jams, Jellies and Marmalades. The Department of Agriculture and Food AN ROIN TALMHA IOCHTA AGUS BIA Food Safety Authority of Ireland" (PDF). Archived from the original (PDF) on 4 March 2016. Retrieved 23 August 2015. Look up jam, jelly, or marmalade in Wiktionary, the free dictionary. Wikisource has the text of the 1911 Encyclopædia Britannica article Jams and Jellies. This article incorporates public domain material from websites or documents of the United States Department of Agriculture. This article incorporates public domain material from websites or documents of the U.S. Government Publishing Office.